You may think of the north pole as an affixed point the very “top” of the planet (which would be correct and that’s called the geographic north pole) but since the Earth is essentially a giant magnet the magnetic north pole is where the northern lines of attraction enter the Earth or where a compass needle will point north. The magnetic is also constantly shifting and moving in the direction of Siberia and away from Canada yet recently the rate at which it’s shifting has accelerated and it’s raising some concerns for scientists. 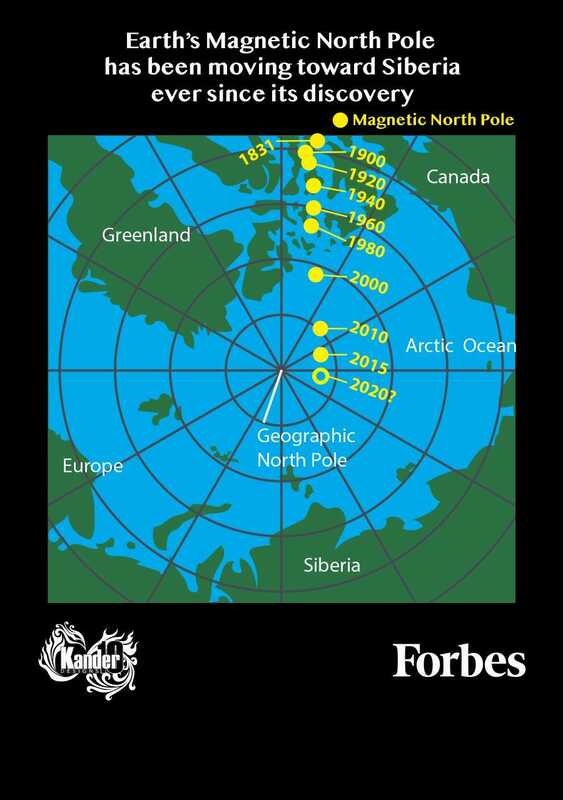 As Kevin Anderton explained in Forbes, every five years scientists recalculate the location of the magnetic pole. This is important information for global navigation, which includes GPS satellites and other technology. These changes can make a big difference in our everyday lives. Scientists at NOAA and the British Geological Survey check how accurate the World Magnetic Model is every year and when they did their check this year they noticed some large differences. Primarily that the pole’s movement had sped up. The location data for the pole was supposed to last until 2020 before it needed to be updated but according to experts at the NOAA, it needs to be updated now and scientists aren’t sure of the cause. Why This Matters: As the Anchorage Daily News reported, because of the government shutdown scientists haven’t been able to post an emergency update the World Magnetic Model, which cell phone GPS systems and military navigators use to orient themselves. Roughly half of the employees at NOAA which hosts the model and publishes related software, are furloughed as the shutdown which has now entered its 35th day. The updated model was supposed to be released this week. It would have been a minor change for most of us — the discrepancy between the model and the North Pole’s new location is only measurable to people trying to navigate very accurately and at very high latitudes. But as long as NOAA staff are absent and the agency’s website is dormant, the whole world will have to go on navigating by the old model — which grows a little bit more inaccurate every day.